The Complete Guide to Giant Amigurumi is an original crochet ebook by June Gilbank. You can upsize almost any amigurumi pattern with the techniques in The Complete Guide to Giant Amigurumi and get an irresistibly cuddly, adorable result. Take a normal amigurumi pattern and enlarge it by 3 to 4 times to make a giant huggable amigurumi! All you need is your favourite pattern, a 15mm hook, and a super-bulky yarn, and you’ll be ready to start. With The Complete Guide to Giant Amigurumi, I’ll guide you through every step along the way, from choosing your materials and learning how to work giant stitches and a better way to make a secure magic ring, to stuffing, assembly and embellishment, troubleshooting, and more. Everything is explained in detail, with clear, close-up photos and instructions. As with all PlanetJune patterns and ebooks, your single-user licence includes access to any future updates (the download button in your order will automatically link to the latest version if there's a new edition of this book in the future). 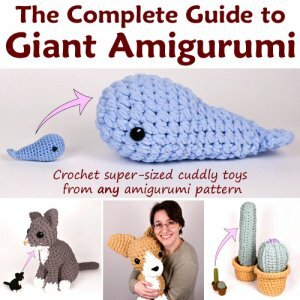 The Complete Guide to Giant Amigurumi ebook is a 50 page PDF file. The filesize is around 9Mb. How large are giant amigurumi? Around 3.5x the size of the original. The exact size will vary depending on your gauge, exactly which yarn and hook combo you use, and how exactly you assemble the pieces (for both sizes). But you can count on a result that's between 3 and 4 times larger than a standard worsted weight amigurumi in each dimension. Date Added: 01/31/2019 by Susanna V.
Date Added: 01/31/2019 by Linda S.